Rapid car check provides a free report which allows you to see a vehicle’s specifications simply by entering its registration. The report is available within seconds of you entering the vehicles registration and doesn’t cost anything. Feel free to give our free check a try by entering a vehicle registration below. This information is especially useful for anyone planning on buying a used car, as you also have the option to upgrade to a deluxe check. Our deluxe check allows you to see if there’s any outstanding finance or hidden history on the vehicle. Once you have entered a vehicle registration and clicked “Check Vehicle Now” you will be taken to the free vehicle report. This page shows you vehicle data and specifications from numerous different sources. 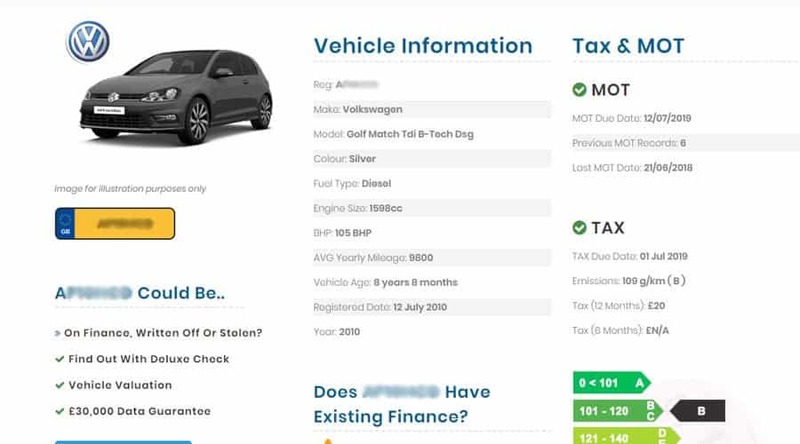 If you are serious about buying a vehicle then it’s worth performing a deluxe check, we currently offer our deluxe check, which is a comprehensive vehicle data check for £8.99. We are one of the lowest cost providers when it comes to vehicle history checks and offer a sample report of the deluxe check, so you can get a feel for what the report includes before deciding if you need a check.